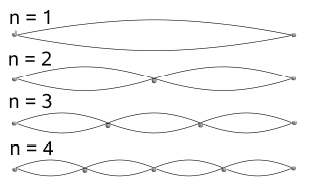 Image at left shows the first 4 modes of vibration of a string. 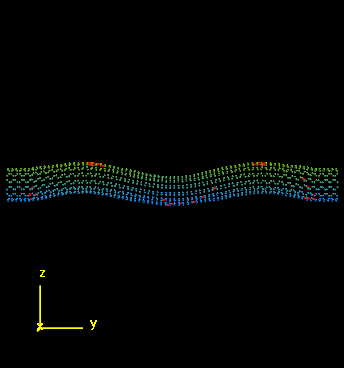 Nanotube images above can be clicked on to view animations. 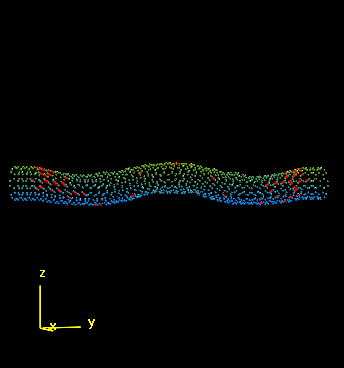 Both nanotubes have frozen ends. The left image shows stages in the vibrations when an ac force of a frequency identical to that of the third mode of vibration is applied, and the right is a rotation of the same tube after steady state is achieved. The tube is color coded for height and stretched bonds between 1.6 and 1.7 angstroms are drawn in red to show where the tubes stretch most.